The Institute involves four weeks of intensive seminars, lectures, readings, films and discussion groups and cultural activities related to Japanese history, culture, literature, government, business, language and education. While modern Japan serves as the focus for the program, participants are provided with a firm foundation in the pre-modern history and culture of Japan. 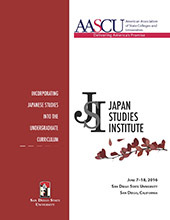 Previous programs have included topics as diverse as wartime and occupation Japan, social relations and the changing role of women in Japan, Japanese foreign policy and regional relations, Koto music, calligraphy, survival Japanese, film, manga (Japanese comics) and Japanese labor-management relations. Classes are held Monday through Saturday, from morning to late afternoon. Sundays and evenings are reserved for free time and/or independent study except June 7, 8 (optional), 9 (optional), 10, 13, 14 (optional), and 16 (optional). The formal program is complemented by a number of off-campus and evening activities. Institute faculty will include scholars, representatives from the local Japanese business community, artists, journalists, and government officials.